Enjoy and get up to 10% off storewide at v.hive. Not applicable to combined with other offers, mattresses and Cash & Carry items. so what are you waiting for? hurry grab yours today! 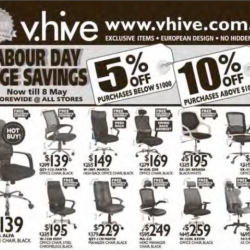 Labour Day Huge Savings at v.hive, now till 8 May Storewide at All stores. Free delivery and assembly is not applicable to Cash and Carry items. All prices are inclusive of GST. Promotion cannot be combined with other offers and is not valid for mattresses and Cash and Carry items. While stocks last.